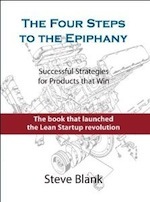 The Lean Startup Circle is a Google discussion group (anyone can join) centered on Customer Development/Lean Startup strategy, tactics and implementation. They were kind enough to sponsor a meet-up in San Francisco. The Times Square Strategy discussion I had with Eric Ries, was still top of mind, so instead of my standard Customer Development lecture, I offered my thoughts on: the origin of Customer Development, where we are today, and where does Customer Development go, and how you can help get it there. The video below was my presentation to the group. The slides below go with the video. Just click through them as you watch the video. Extra credit if you know the back-story of slide 1 and why it’s appropriate for founders and their team. Thursday is Thanksgiving Day in the U.S. I’ll have a non-entpreneuership post about family and reflection. This is an awesome post and I really appreciate the availability of the slides as well as the video. By seeing the video, I gained some more understanding of the slides and concepts (which I have read about on your blog). I like your comment on “get liquid in a bubble”. 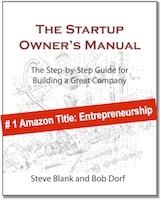 Our startup was venture funded in 1999 and we didn’t pay enough attention to this advice! We also took over 6 months and $2M to get to an alpha and, yes, we built it in a vacuum. When we did get customer feedback that the product wasn’t exactly what they wanted it was hard to hear and also hard to recover from since we had spent most of our “A” round getting to that point. My takeway from that episode was fail fast, fail often – it’s easier now that it’s cheaper as well! I also like the segment on characterizing your market. Sometimes that can be hard. For example, our company finances renewable energy installations (solar, fuel cell, etc.) and I am not sure if that is (a) a new market or (b) a segment of the existing market for energy. Under (a) we need to wait for the market to continue to develop, have reference customers, etc. while if it’s (b) we can shovel money out the door creating demand and sell into it. Renewable energy has elements of both though because it is a new product market, but also is better (cleaner) or cheaper (sometimes). Diggin’ the presentation so far, looking forward to catching the rest of this later in the day. I haven’t had the opportunity to listen to you talk before Steve, it’s a fun experience to put a voice to the ideas I’ve been reading for quite a few months. 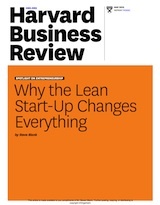 Big thanks for the continued sharing, and certainly the link to Lean Startups. I posted my first request for feedback there today.